Trust the process. The idea was to run as much as I could, to be healthy and being fit right throughout. I think I have more or less achieved that goal this year. On to the numbers. Last year, I had set myself a target of running 520 kms (at an average of 10 kms per week), and fell woefully short. So this year’s target was 260 kms (at an average of 5 kms per week). Although not consistent, I have run 507 kms this year. Out of which 130-odd kms have been while participating in events. The net result has been that I’ve had a wonderful running year. I’ve travelled to some beautiful places (Cherrapunjee, Srirangapatnam) and made some great runner friends in different cities and in my own city of Calcutta. And most importantly, I’ve become a better and stronger runner. I do wish I had been able to write more blog posts about how the runs are going. I especially wanted to write about my experiences of running in Airtel Run For Education 21k, Puma Urban Stampede 10k and the Tata Steel Kolkata 25k. Thanks to these events, I’m ending this year on a high. It was easier to keep myself motivated and run in these well managed events that were organised here in Calcutta. Here’s looking to an even more wonderful 2016. Cheers! “Don’t try for your personal bests here, because it most probably will not happen,” said the race co-ordinator at the start line as we waited for the half marathon to start. “No fear of that happening,” I mumbled to myself. I was so confident of my inability to put in my best for this run because of two reasons. First was a basic problem: I’d barely run or trained since the Cherrapunjee Marathon back in July. The other reason why I was sceptical about being able to put my best foot forward was that I’d barely slept in the 24 hours before the race. It all began on 18th September, two days before the event, the day I flew in to Bangalore from Calcutta. I had only slept a couple of hours before the early morning flight and so, slept like a log that Friday night. Come Saturday evening, I knew I was in a bit of trouble. I hadn’t slept throughout the day and the expectation of the event was keeping me up at night. The event itself is held at the Ranganathittu Bird Sanctuary at Srirangapatnam, which is about 3 hours drive away from Bangalore. I’d opted for the bus the event managers had organised which was to leave from Bangalore at 2:30 AM. I had no trouble at all in finding the bus but the drive does take too long and is tiring. In fact, I was so tired waiting for it to be 2 AM so that I could leave my friend’s house in Bangalore, that I almost contemplated not going for the event at all. Once at the venue, I was again impressed with how smoothly everything was managed; my running bib and bag was given to me without any hassle, and I’d been a little sceptical since I was an outstation runner and could’ve collected these only on the day of the event itself. Handing over my bag at the storage area, I walked over to the starting point of the race just as dawn was breaking. The half marathon started punctually at 6:30, half an hour after the full marathon had kicked off. Like I said, I wasn’t expecting miracles to happen at this race. I was underprepared and under-trained. In my mind, I was going to use this as a starting point for my training for my first full marathon, the Standard Chartered Mumbai Marathon in January 2016. And so, to get myself through what I thought would be (and was) a gruelling run, I set myself a mantra. I’d recently read about how repeating a mantra can be helpful, and so I decided that my mantra for the day would be “flow”. The word had a magical effect on me. I usually pay a lot of attention to my form and maintain it religiously at least for the first couple of kilometres of a run, before exhaustion takes over. Somehow, repeating the mantra made me feel like NOT keeping to the form and just going through with whatever felt natural. As a result, I was less tired by the time the first “wave” of exhaustion hit me, which usually happens around the 5-6 km mark and which is when I enter what I call my “zone”. Once inside the zone, I usually don’t need to break much either for a short walk or for water. I don’t know whether it was purely because of the zone or because of the mantra, which by now I was repeating with every out breath, my zone lasted for about 10 kms. Initially, I was only telling myself, my body, to flow. To not worry too much about form, to not hit the ground hard but to just “roll” along with every foot strike. But as I went along, I don’t think it was restricted to just my physical form. I could feel the breath and the energy flowing through me. And even when I did get a little tired, the stream from the Kaveri river which was gently running past me would remind me of my mantra. It was a beautiful run, going past sylvan fields and dusty trails. I couldn’t help but smile as I’d spot a bullock cart. Although I’d initially planned on running without listening to any music, at the last minute before the run began, I switched on a classical music concert by Pandit Ravi Shankar which he had performed at the Kremlin. Listening to the strains of the sitar as I ran past the beautiful green countryside, spotting a farmer here, spotting a stray bullock there, was immensely satisfying, as it was much different than the usual runs that I go for in the traffic on city roads. I told myself that it was a good thing I didn’t back out of this run. But eventually, the lack of training caught up with me. Around the 15-16km mark, my lower back started hurting and I could feel my right hamstring beginning to cramp. I walked till about the 17km mark, and then tried to run a bit, only to stop immediately because by now somehow both my legs had started cramping. I was hobbling along, to be honest. Here, I must mention the excellently organised facilities. There were refreshments at regular intervals and these were well stocked with water, energy drinks, peanuts, glucose biscuits and even chips! There were also cans of pain-relief spray which helped me to get a move on and finally finish the race. One very heartening thing to see was that most participants had taken to heart the organisers words about keeping the bird sanctuary clean; most of the cups of water were thrown away in the bins itself. 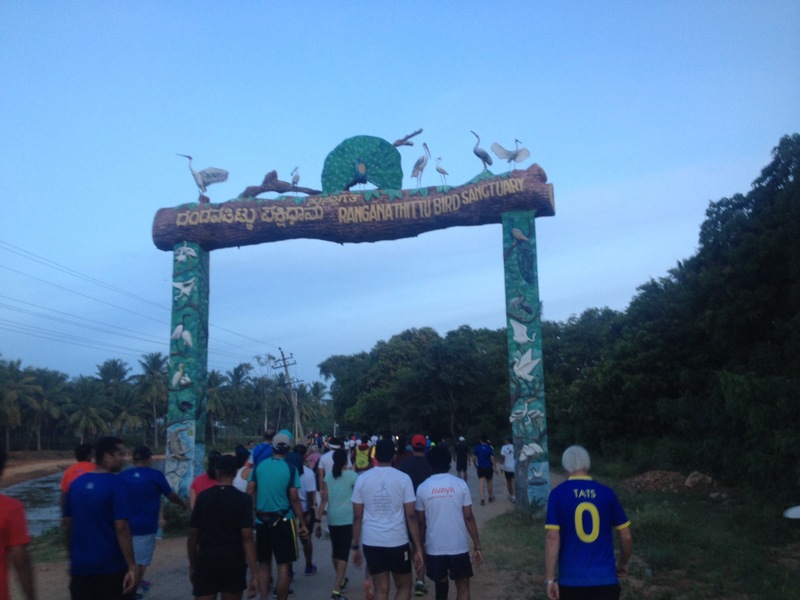 This was the least we could do by way of thanking the Ranganathittu Bird Santuary officials who had agreed to allow use of the venue for the run. We ate a good, hearty breakfast after the run and soon, the buses to Bangalore and Mysore were ready to take us back. Here’s where I encountered the toughest part of the day. Sitting in a bus, on that hot Sunday afternoon, after having run a half marathon and then walking and figuring out my way back to my friend’s place once I was dropped off in the city really got to me. I was tired and exhausted and needed to rest as quickly as possible. I realised that the best way to participate in the Kaveri Trail Marathon is to come over a couple of days in advance and find accommodation at Srirangapatnam, or at least at Mysore. That way, the travel time before and after the run is reduced, at a maximum, to about an hour. The body can do with that kind of rest. 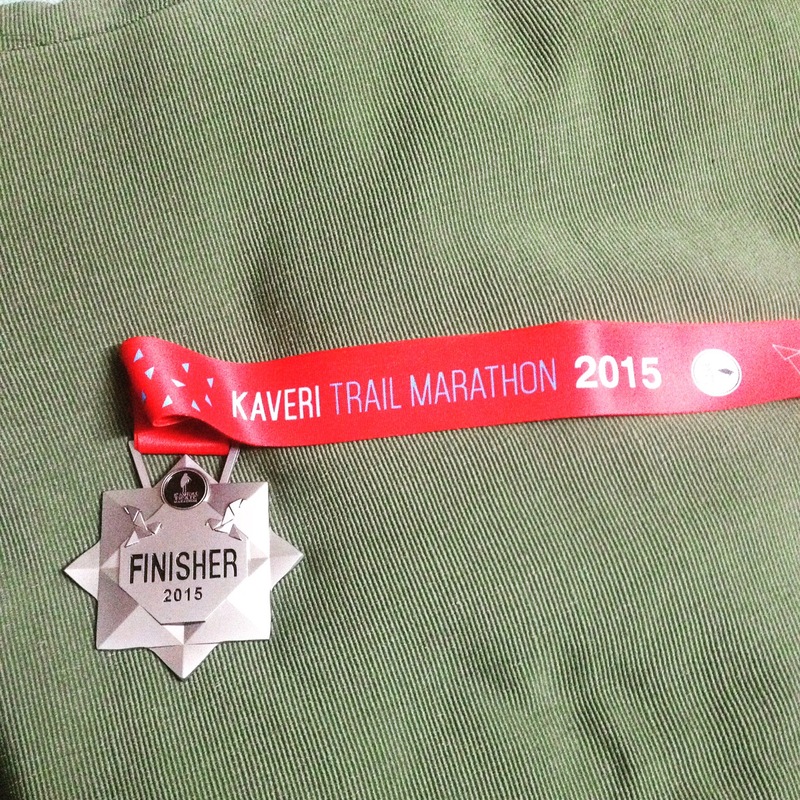 I finished the Kaveri Trail Half Marathon with a timing of 2 hours 40 minutes 38 seconds, which is almost exactly how much time I’d taken to finish the Cherra Marathon. Given that that was a more challenging run, what with all the uphill running, this was strictly an average performance in comparison. But purely because I felt more connected with something inside me, thanks to the mantra, I’d rate this as a more satisfying run. The next running event that I will be participating in is the half-marathon at the Kaveri Trail Marathon (KTM) 2015. This will be my first trail race and I’m really looking forward to running on new terrain. KTM will be run on 20th Sep this year, which gives me little over a month to prepare. Around that time is also when I will be launching into my marathon training for next year’s Standard Chartered Mumbai Marathon, where I’ll run my first full marathon. Needless to say, I need to start preparing. Having run a couple of half marathons, I think I’m now ready to attempt the big one. A full marathon. And in this spirit of adventure and reckless abandon, I’ve signed up for the full marathon at the Standard Chartered Mumbai Marathon 2016. The race will be on the 17th of January 2016, which gives me six months to prepare. I have a couple of half marathons till then, and of course, I’ll be training myself separately too. No fancy stuff, I’m just looking to complete my first marathon in 5 hours. Well, 4 hours 45 minutes if I can really push myself.